Time to leave Hope of Life – what an incredible place. The work that Jeff has done here is truly remarkable. You can’t leave without being changed and re-evaluating your life. What is it that really matters? How precious life is in any form. Be the hands and feet of Jesus to the unlovely, forgotten, and seemingly insignificant people who are left behind. Challenging! Back to the helicopter to go to Antigua for a couple of days before heading home. 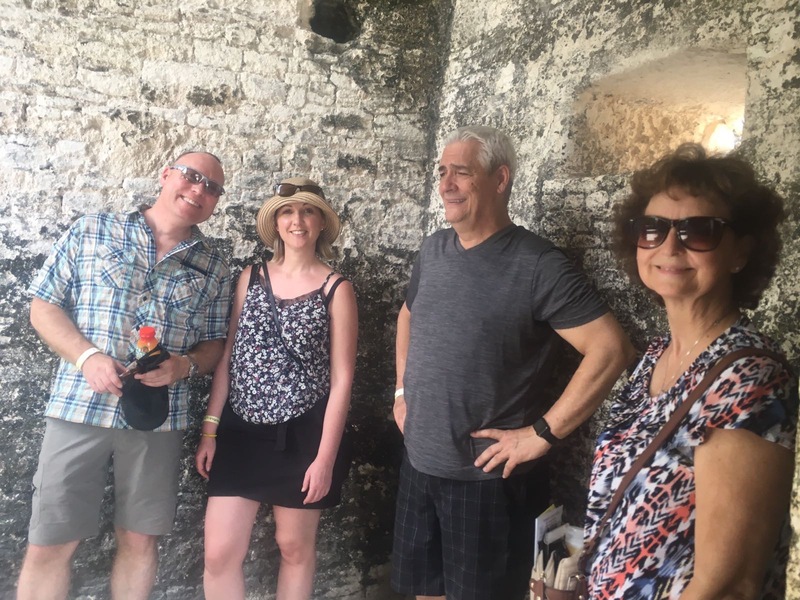 On our way we made a stop in Tikal, one of the largest ruins in the Americas and a national heritage site. These ruins were home to the Mayan Indians and date back to 900 B.C. One theory is by clear cutting all the trees in the area to burn, (they used the ashes to make a cement like substance to hold the stones of the pyramids and houses in place) changed the climate to the point where there was a drought. At the same time they had increased in numbers to the point where the land could not sustain them. As a result they abandoned the city and dispersed to the surrounding areas. Over the centuries the pyramids were covered over with dirt, plants and even trees making them look like just hills in the jungle. The ruins were not discovered until the 1800’s. They are impressive. Each palace was strategically placed to allow wind to blow through holes cut up on the walls to create natural cooling. The King’s bed was king size! There were at least 10,000 people (some say 60-70,000) who came in and out of the main area to buy, sell and trade. The road that they built leading up to the entrance was wide and long, the whole place was huge. The height of the tallest pyramid was over 200 feet tall. This was a special treat because we probably would never have driven the 8 hours just to see them. We saw the beautiful Keel Billed Toucan fly by, spotted a Red Warbler, saw spider monkeys and heard the Howler Monkeys. 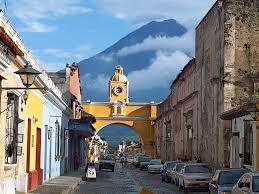 Then on to Antigua – the original capital of Guatemala. Antigua was destroyed by a series of earthquakes over 200 years ago. The capital was then moved an hour away and renamed Guatemala City. Antigua is unique, it’s like stepping into another world in another time. The streets are all cobblestone and lined with high stone walls. The doors in the walls are often very tall and wide to allow the horse and carriages to go inside. At first glance it looks plain, but once inside one of these doors, it opens up into spacious lobbies, lush courtyards with rooms around the perimeter. Often whole blocks were one house. These houses have been turned into hotels, divided up into restaurants, stores and mini malls. Of course there is the large main square with huge old trees, plants and large grassy areas with the church, governments buildings and businesses around the perimeter. Our hotel was a smaller house with a beautiful courtyard and six guest bedrooms. The walls are over two feet thick, stone fireplaces in each room, a stone shower that you step down into, a thick wooden door with an old skeleton key. 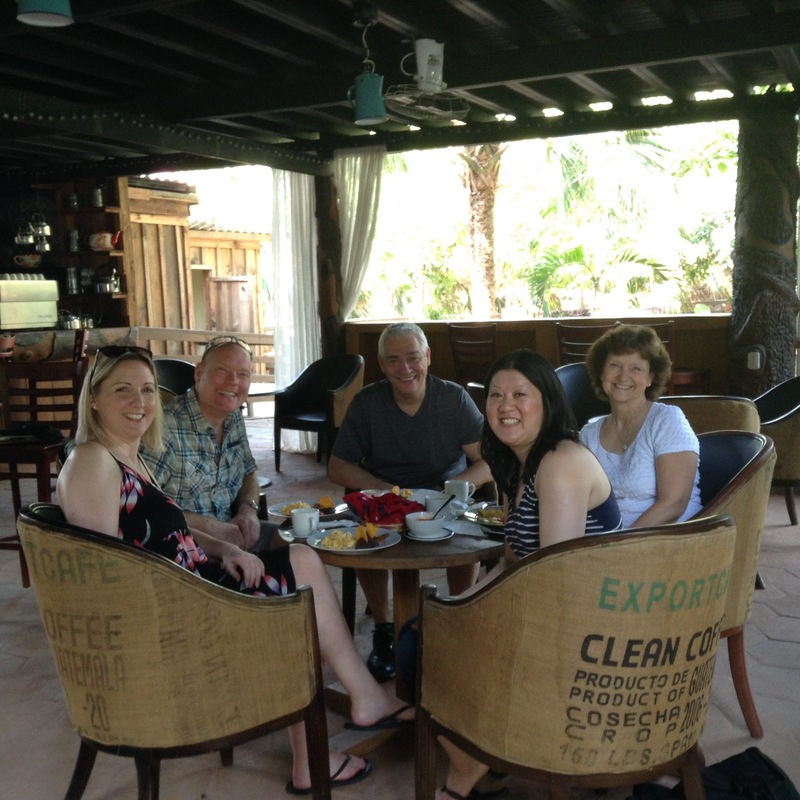 Breakfast was on the terrace, in the courtyard or in your room. With the water in the fountain and the birds in the trees it was a peaceful oasis to just sit and soak in. What a treat! It was Semana Santa (Easter) while we were there and the festivities were going on all week. People poured into the city, the streets were jammed and many roads were roped off for the processions which took hours to complete. The main one was on the Friday, it started at 3:00pm and would not be totally finished until 4:00am the next morning. The large extremely heavy floats depicting different scenes of Jesus on the way to the cross were carried by 15-20 men on each side. They swayed back and forth advancing very very slowly. We found out that in order to get a place to carry one of the floats they had to put their name in three to four years in advance and then they had to be chosen. Once chosen there is a fee of course for this privilege. Apart from the floats there were banners, bands playing dirges, lots of incense and a variety of priests dressed according to their positions. Apart from the actual parade there were men everywhere dressed in purple robes. Mike asked one of them, who was standing with his wife and child, why they were dressed like that. His answer was that they were doing penance. Mike looked at the wife and asked her if he needed to do penance and she said most certainly yes! There were a lot of men dressed in purple! 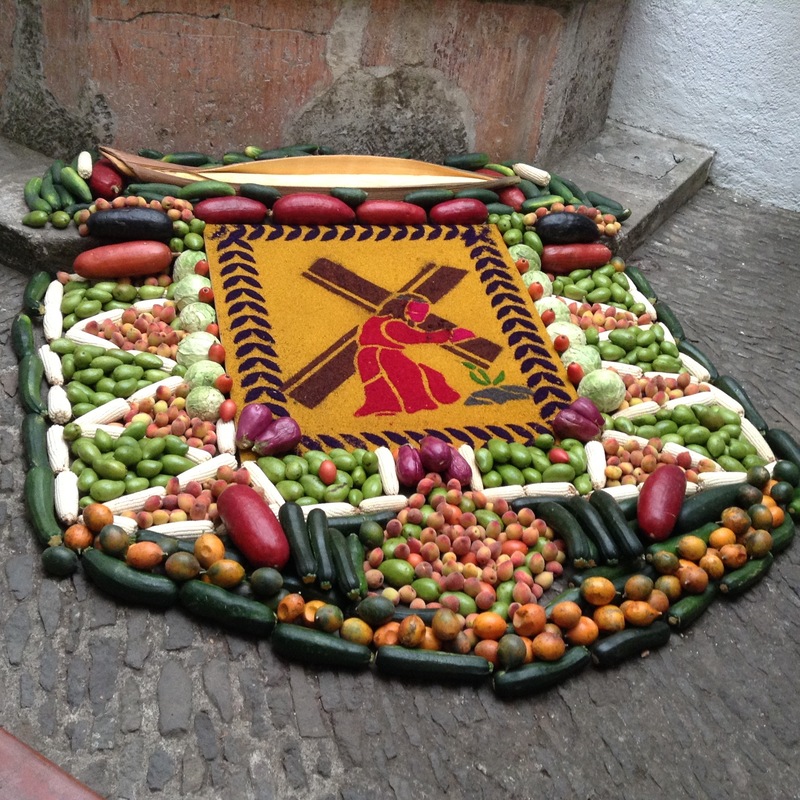 The streets were prepared with elaborate dyed sawdust designs that were 30 or 40 feet long. They must have been up all night doing them. The parade would come and everyone walked on the outside until the large float came by and walked right over the sawdust art ruining it. I thought of the sand castles that the waves wash over and destroy. I guess the sawdust represents the palm branches that the people laid before Jesus on the donkey when he arrived in Jerusalem. When people couldn’t read, or the Bible was in Latin, these processions had a purpose, like the stained glass windows – to tell the story, remind them of the story, and now it is part of the traditions and culture and I’m sure have evolved over time into what is the countries most celebrated holiday. How grateful I am that I don’t have to dress up or pay money to have forgiveness or be blessed. The pageantry was a moving experience, a great reminder of what our Saviour endured, but I wondered if Jesus would want all this fan fare, or would he just want us to go about doing good, care for the poor, sick, and widows with humility, not calling attention to ourselves. With all the venders on the streets selling rosaries, statues, toys and food and everyone yelling to get your attention, it had a carnival feel and a funeral feel all at the same time. I thought about the money changers that Jesus overthrew in the temple. Our flight back home was on Saturday so I was wondering if Sunday had the same type of celebration for the resurrection. More joyful and celebratory? If it wasn’t for the resurrection the death would have no meaning. It is important to be reminded of the enormous sacrifice of our Lord but Jesus is no longer on the cross, He is Risen! There was a purpose for the cross, to pay the price for our sins, but without the resurrection it would have been worthless. I was talking with Carolina, a friend who grew up in Guatemala going to these processions her whole life and then having a personal experience with God that changed her. I asked what was different between being a faithful Catholic and doing all the rituals and traditions and now. Her answer was that before she read all the Catholic books and even taught the catechism classes, but she had never read the Bible for herself. When she was an adult she got a Bible and started reading it and she prayed for God to make himself real to her. He did and she has never been the same since. I am all for all the traditions if they lead you to that place. If they lead you to your spirit coming alive and where you are changed, and continue to be changed, where Jesus lives in your heart and is with you always, no matter where, no matter what. The church is just a place to fellowship with others who love God, to hear teaching, be encouraged in your faith, but being a Christian is what you are like outside the church, in your daily life when no one is looking. This is not something you are born with, or because your mother was a Christian you are one too, or because you go to church or go through the motions. It is a personal decision and experience that is unique to each individual. Religion can put God in a box, making Him small and one dimensional. There are absolutes of course, a guideline for making life work, but worship should be creative, not rote. Our prayers should be spontaneous not memorized. Our relationship should be alive at all times and should stretch us, teach us, guide us, astound us, surprise us and bring true joy. Not to say we won’t have trials and suffering, and we certainly aren’t perfect, but we are being perfected as we walk out our life submitted to His will – which is never boring! Our last night was spent with the Toledo family. As Mike says, he is the most interesting man in Guatemala. He started out as a mechanic with Toyota but had a passion for art and collected works from all the famous artists in Guatemala to preserve them. Then just a few years ago he tried his hand at art himself and has become famous – his sculptures are in Washington DC, Mexico City, Amsterdam, France and th UN to name a few. He paints as well. 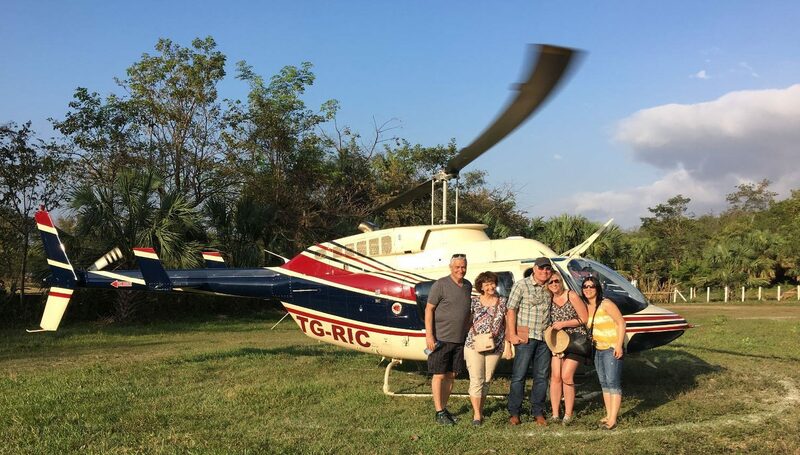 His daughter Ana Regina is a volunteer with Global Priority and does training throughout Guatemala. This is where Mike stays when he comes to Guatemala, they have a nice suite on the side of their house. 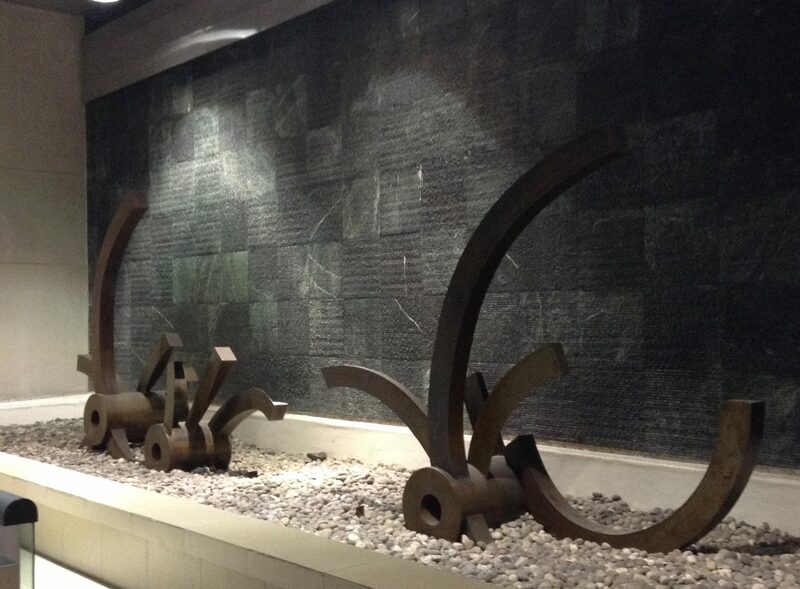 His sculpture at the Guatemalan airport. 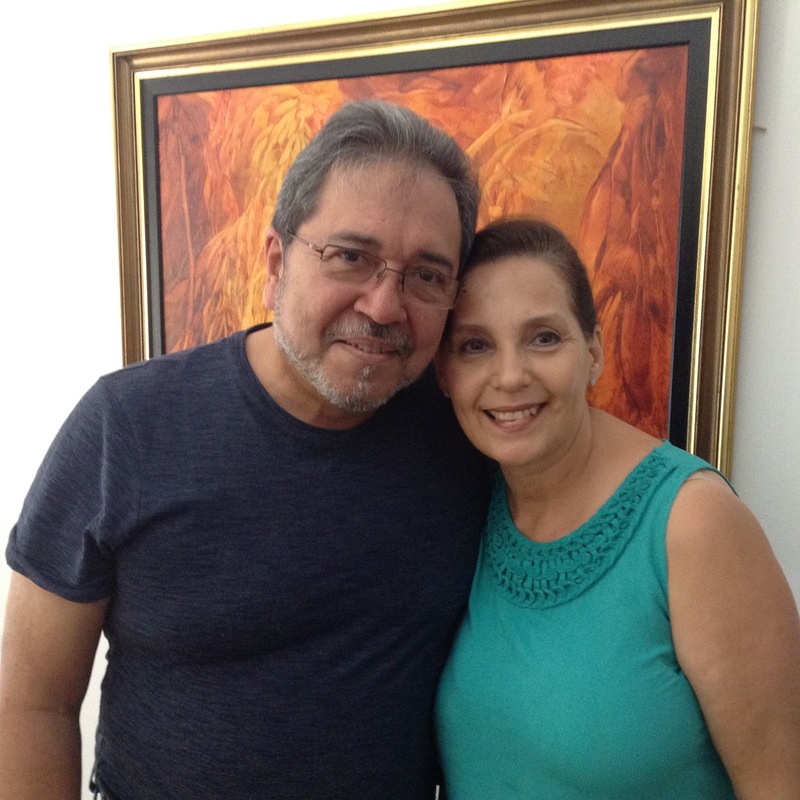 Their daughter Ana Regina has been working with Global Priority as a volunteer for five years now. 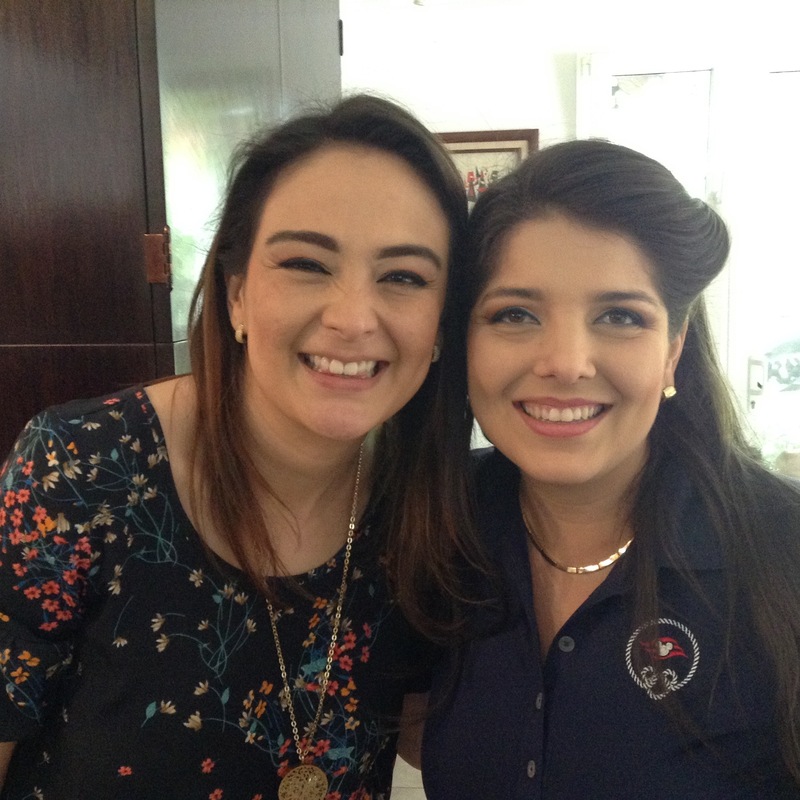 She goes to businesses and government offices and does Round Table training, she promotes and does follow-up. Carolina has been doing television and daily radio but is getting married and moving to the States. Ana will take on much of what Carolina was doing with the radio program. What a blessing to have such quality people dedicated to instilling God’s values and who work tirelessly promoting these values in their country.